Perhaps many of you would agree when we say that the home is a magical place. It’s where we feel most safe and comfortable—a haven where we get to enjoy the things we love and a safe ground where we spend quality time with friends and family. For those who are required to travel for work, it’s also a sanctuary that welcomes us—a special place that feels just as cozy and inviting—even if you've been away for awhile. 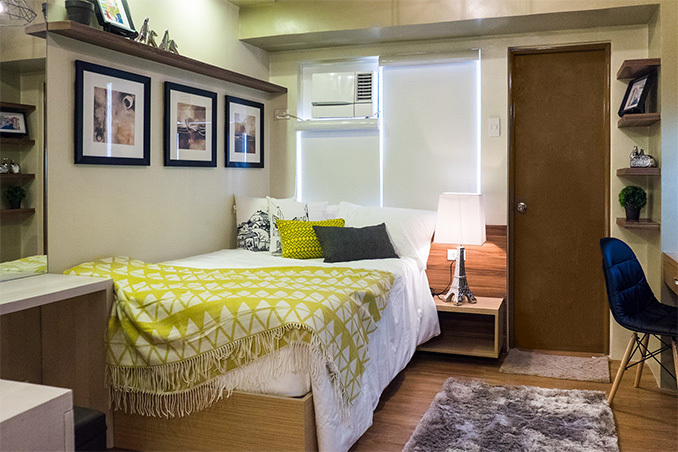 For this 21sqm unit in Mandaluyong, designer Roland Lustado was asked to create a snug yet functional retreat for the owner who travels a lot. Given the limited space, he opted for a contemporary theme with elegant touches and a minimalist appeal. Choosing neutral colors, multipurpose pieces, and custom-made must-haves—he was able to achieve a welcoming unit that not only echoes traveling, but a true home sweet home that the owner can be proud of. Ready for your own makeover? Get in touch with designer Roland Lustado through mobile at 0920-928-5768. You can also e-mail him at rolandlustado[at]yahoo.com.